Here you'll find the top stainless steel and non-stick sets. We've done the research and found the best of the best. 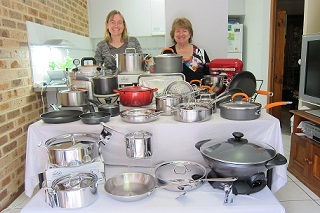 Read our buyers guide to help you choose the best cookware for you. Shop with confidence from our recommended online cookware merchants. Read our personal reviews of different products. Want to do a bit of research? Take a look at our articles, guides and press releases. What Criteria Do We Use to Recommend the Products on Our Site? Our recommendations are based on a number of factors including consumer reviews from those who have actually used the product, cookware retailers opinions and comments, blog and website reviews and our personal opinion if we have personally reviewed the product ourselves. We also research individual kitchen cookware manufacturers, including Calphalon, All Clad, Cuisinart, Le Creuset and Rachael Ray, just to name a few, to determine the materials used to make their products and their attention to detail in the manufacturer of their cookware. We look for products that are easy to clean, preferably dishwasher safe and are good value for money. They must also have a warranty and good customer service. Ultimately, we only recommend products that we would buy ourselves. Disclaimer: This website/blog is not sponsored by any cookware manufacturer or company. We, as individuals, have developed this site as a resource for cookware and related products and write our reviews based on the merit of each product which may be based on other people’s reviews or our own testing of the product or both. On occasion we do receive sample products from cookware companies however wherever this has occurred this has been stated in the specific review. Our reviews will often contain affiliate links to products which enables us to subsidise this website and blog based on the commission we receive from purchases made via those links. Only Cookware is a participant in the Amazon Services LLC Associates Program, an affiliate advertising program designed to provide a means for sites to earn advertising fees by advertising and linking to amazon.com.